Abstract - Long Term Evolution based networks lack native support for Circuit Switched (CS) services. The Evolved Packet System (EPS) which includes the Evolved UMTS Terrestrial Radio Access Network (E-UTRAN) and Evolved Packet Core (EPC) is a purely all-IP packet system. This introduces the problem of how to provide voice call support when a user is within an LTE network and how to ensure voice service continuity when the user moves out of LTE coverage area. Different technologies have been proposed for the purpose of providing a voice to LTE users and to ensure the service continues outside LTE networks. 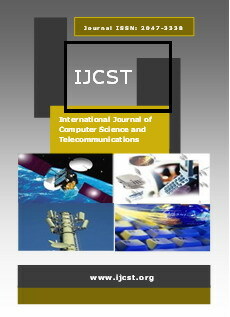 The aim of this paper is to analyze and evaluate the overall performance of these technologies along with Single Radio Voice Call Continuity (SRVCC) Inter-RAT handover to Universal Terrestrial Radio Access Networks/ GSM-EDGE radio access Networks (UTRAN/GERAN). The possible solutions for providing voice call and service continuity over LTE-based networks are Circuit Switched Fall Back (CSFB), Voice over LTE via Generic Access (VoLGA), Voice over LTE (VoLTE) based on IMS/MMTel with SRVCC and Over The Top (OTT) services like Skype. This paper focuses mainly on the 3GPP standard solutions to implement voice over LTE. The paper compares various aspects of these solutions and suggests a possible roadmap that mobile operators can adopt to provide seamless voice over LTE. Abstract - Orthogonal Frequency Division Multiplexing (OFDM) provides high data rate transmission in the given bandwidth of the channel. The main problem with the OFDM system is that it is prone to the channel-induced noise that corrupts the data during transmission and thus the Bit Error Rate (BER) of the system increases. So Turbo encoder is proposed in this paper which implements channel coding thus adding redundancy in the message bits that helps to improve the BER of the system and ease reliable data transmission. Log-Map decoder is used for the decoding purpose that consists of two elementary decoders where each one calculates the extrinsic value in the log domain and exchanges information with each other that take place to come up with the more accurate detection of the transmitted data. Similarly the delay spread introduced between the signals during transmission and the filtering effect of the transmission system causes the symbols to interfere thus introducing the Inter Symbol Interference (ISI) which degrades the error-performance of the System. To cope with this problem, cyclic prefix is inserted at the start of the transmitted OFDM symbols to tone down the effect of ISI. Performance of Turbo Codes in OFDM System is observed for different digital modulation schemes in Additive White Gaussian Noise (AWGN) channel. Abstract - Advocates of Smart Grid networks implementation in Ghana believe that Smart Grids will deliver a more secure, sustainable and affordable energy for future generations of Ghanaian consumers. It is also believed that Smart Grids would underlie much of the infrastructure which makes everyday life possible. In order to realize this dream, an Ultra High Frequency (UHF) telemetry system has been used to deploy pilot Supervisory Control and Data Acquisition (SCADA) networks in the urban centres of Accra and Tema as a starting point in implementing a full nationwide Smart Grid Network for the energy generation and distribution sectors of the country. Evaluation of the deployed pilot network showed that the limited coverage range of the UHF system inhibits a full nationwide deployment. The evaluation also found serious security vulnerabilities in the deployed SCADA model. In order to achieve the aim of deploying a secure and ubiquitous intelligent SCADA network which serves as the data processing and collection infrastructure in a Smart Grid network, this paper has proposed a secure SCADA model using WiMAX technology to help improve the efficiency of current energy production, management and distribution sectors of the economy. Abstract - With increasing demand of security, ample of security measures and techniques have been proposed in the literature. Text or password based authentication can be easily compromised with few finger strokes or attacks. Image-based-authentication (I.B.A.) is a good alternative since images are easier to recall than alphanumeric passwords. Therefore, in this paper a novel approach has been proposed which supports script provided by its user to generate password by using image partitioning. It increases the extent of security and provides a user-friendly environment. It displays a set of image blocks that are randomly arranged. The user has to rearrange the image set by moving some blocks at their correct place according to his script, in order to get successful access. Abstract - Wireless Sensor Network consists of an enormous number of small disposable sensors which have limited energy. These sensors cannot be replaced once they are deployed, as the users usually have no access to these nodes. In many situations like battle field monitoring, rescue operations, the battery operated nodes usually have no accessibility and thus its battery can't be replaced. Hence, energy efficiency is the key research question in wireless sensor networks that is required to be fingered sensibly in order to prolong or improve the life time of the network. An extensive amount of energy is consumed during routing operations; because of this it is the hottest research area in WSN. In the proposed mechanism, the operations of network are divided into different phases. These are cluster setup, intra cluster communication, and Cluster Head-Base station communication phase. In Cluster Head-Base station communication phase, the base station construct a shortest path rooted at base station discussed in algorithm 1. The data is sent to BS via these paths. The Hierarchical Energy Efficient Routing Protocol (HEERP) distributes the energy load in such a way that every sensor node will consume its minimum average energy to improve the network lifetime. Simulation results show that the life time of the proposed model is competent as compared to existing techniques. Abstract - In Ghana, mobile subscribers who weren't satisfied with the services of their mobile service providers had no option but to give up their numbers when switching service providers. As such, subscribers were reluctant to switch from their operator to a competitor thereby preventing effective competition in the Ghanaian mobile communications sector. This necessitated the National Communications Authority (NCA) to develop a Mobile Number Portability (MNP) Policy in consultation with the mobile Service Operators. This MNP Policy has been recently implemented successfully enabling mobile subscribers in Ghana who were hitherto reluctant to bear the cost and inconvenience of switching operators, to fully exercise their freedom of choice. Analysis of data shows subscribers porting in and out of all the mobile communication networks. The average net effect of porting in and out as at March 2013, expressed as a percentage of a network's most recent reported subscriber base was about 4.4% and 1.9% respectively. This paper discusses the implemented network architecture of the MNP model and evaluates the performance of the MNP system during its two years of implementation in Ghana. The average porting duration during the first two months of implementation has also been presented and discussed accordingly. Abstract - Mobile Ad-Hoc Network (MANET) consists of multiple mobile nodes that communicate with each other wirelessly by creating a dynamic temporary network. The primary choice for sharing of data in MANET is Orthogonal Frequency Division Multiplexing (OFDM) that promises high data rate communication and better bandwidth utilization. But the main problem with this technique is that due to the mobility of nodes in MANET Doppler frequencies are engendered that offsets the sub-carrier frequency in OFDM that degrades the error performance of the system by introducing cross talk. So Inter Carrier Interference (ICI) is introduced in the OFDM Symbols between multiple sub-carriers that disturbs their Orthogonality and degrades error performance of the system. To tone down the ICI, frequency domain (one-dimensional) channel estimation technique using Block-Type pilots is proposed in this paper. At the receiver side to nullify the ICI, frequency domain Zero-Forcing Equalization (ZFE) is used. The other problem tackled in this paper is data corruption due to noise addition during transmission. Therefore, error-correcting Turbo Codes are used which adds redundant bits in the data to trim down noise effect. At the receiver side Log- MAP decoder is used to iteratively decode the encoded bits by exchanging intrinsic information (Log-Likelihood ratio) between each elementary decoder for more accurate data detection. The simulation is done using an indoor channel model that is Saleh Valenzuela (SV) Channel with AWGN for different digital modulation schemes. Abstract - Now days the Mobile ad hoc networks (MANET) become an important field in the wireless area for user applications. Due to its dynamic nature of this networks the main problem is how to design an effective routing algorithm that can adapt its behavior to frequent and rapid changes in the network due to high speed of each mobile in the network. The paper presents a new idea for MANET routing enhancement named an Intelligent Ant Sense (INTANTSENSE) routing protocol based on ant colony optimization. It utilizes a collection of mobile agents to perform optimal routing activities. The idea of this routing protocol is based on capability of reactive routing with distributed and multipath routing mechanism with utilizing the benefits of pheromones concept of ants in its nature to perform optimal path, fast route discovery and effective Sense routing failure handling. Intelligent Ant Sense routing protocol (INTANTSENSE) compared with AODV protocol using network simulator-2.34 (NS-2.34) in case of different speeds to show the performance of Intelligent Ant Sense routing protocol in dynamic network with many cases of speeds and two cases number of nodes. Abstract - A Pseudo Random Numbers Generator (PRNG) based on chaotic systems is developed in this paper. The main goal of this paper is to increase the security of a chaotic crypto system especially against known plaintext and chosen plaintext attacks by coupling two chaotic systems, the Hénon map used to generate the chaotic sequence and the logistic map to control a multiplexer that outputs is x(k) or x(k-1) of the Hénon system according to the value generated by the logistic map. In order to generate a strong pseudo random sequence, the output of the multiplexer is then pass through a logical circuit which is also controlled by the logistic map. After the analyses of simulation results, the design will be implemented on FPGA reconfigurable Hardware. The results show that the proposed generator generate a pseudo random sequences that satisfy all the NIST statistical tests, offers a high throughput and has low cost for hardware implementation.